James Robin Stockman, 84, a retired Marine Corps colonel who served in World War II and the Korean and Vietnam wars, died of liver failure February 17, 2000 at Inova Fair Oaks Hospital, Virginia. 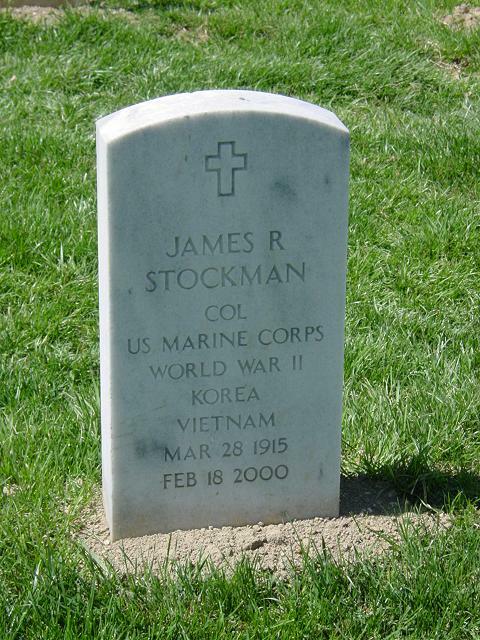 Colonel Stockman joined the Marine Corps in 1942, and he retired in 1969. His World War II service included combat operations at Saipan and Okinawa. He was author of "The Battle for Tarawa," the official Marine Corps account of that operation, and he also wrote books about the Okinawa and Saipan campaigns. Colonel Stockman was managing editor of the Marine Corps Gazette and an instructor at the Naval ROTC unit at the University of Nebraska. He was a graduate of the Marine Corps Amphibious Warfare School at Quantico and the Imperial Defense College in London. His decorations included a Silver Star, Bronze Star and Legion of Merit. In retirement, Colonel Stockman was a military analyst with RCA for three years, then an analyst with Potomac Research Institute. A resident of Fairfax, he had lived in the Washington area for 45 years. He was born in Malta Bend, Missouri, and graduated from Central Missouri State College. He was a Missouri schoolteacher before joining the Marines. His first wife, LaNelle V. Alexander, died in 1993. Survivors include his wife, Elanore V. Stockman of Fairfax; two stepsons, Bruce Alexander of Huntersville, N.C., and Glenn Alexander of Silver Spring; and a brother. On February 17, 2000, at Fair Oaks Hospital, JAMES R. STOCKMAN of Fairfax, VA, loving husband of five years to Elanore V. Stockman. He is also survived by a brother, Frank D. Stockman of Sun City, AZ, and two step-sons, Bruce Alexander of Huntersville, NC and Glenn Alexander of Silver Spring, MD. Funeral services will be held on Thursday, March 2, 1 p.m. at the Ft. Myer Chapel. Interment Arlington National Cemetery with Full Military Honors.